at the newly renovated flagship headquarters location of 676 Pismo Street (downtown San Luis Obispo). Guests will be treated to light refreshments and snacks, live music (most likely from Dr. Kelly Moreno of Cal Poly With Musical Friends), as well as volunteer docent led tours of the facility. The event is informal and guests may come and go during the designated times of 3pm-6pm! 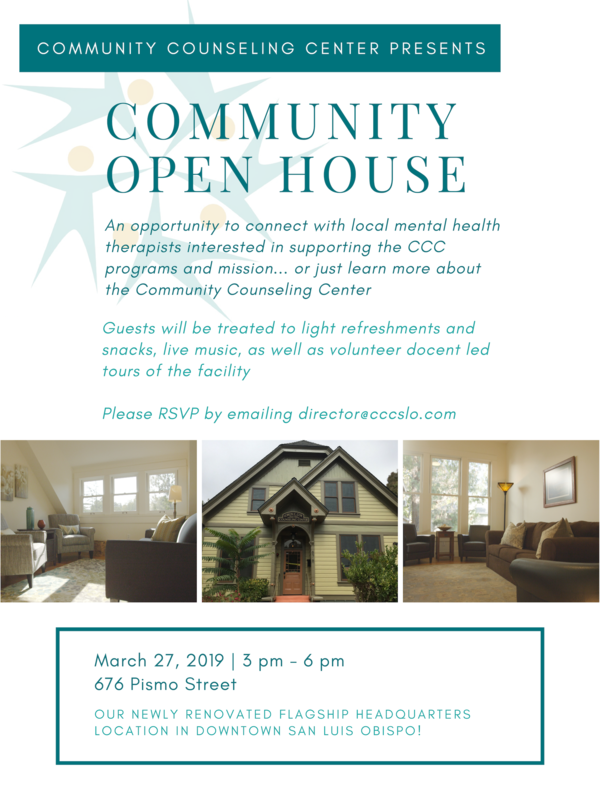 We hope to meet with our non-profit mental health/social service sector partners, connect with local mental health therapists, display good stewardship to our donors, and thank our volunteer therapists, Board of Directors and Campaign Cabinet. Please feel free to RSVP by emailing director@cccslo.com (this will help us gauge the crowd and resource needs). Happy early Spring and we look forward to showcasing the center in-person with you all on March 27th!